I worked at my internship Monday, Wednesday and half a day Thursday. 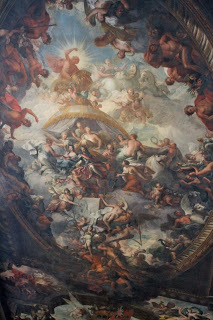 Based on the articles I wrote this week, I can tell you about the top 5 war memorials in the world, the top 5 Chinatowns and the best upcoming festivals worldwide for the next month (Carnival, anyone? They’re going to be everywhere! But then again, Japan’s naked man festival might be more up your alley). I also ventured into the chilly London afternoon to ask locals about their tips for saving money in the city. Most people said they didn’t budget, so I didn’t learn too much (except that I shouldn’t follow in the example of one 18-year-old and spend 500 pounds on one shopping spree). My internship class went to the Guardian, where we talked with Peter Preston, who was once its editor for 20 years. The Guardian office is enormous and home to many different publications. It looks very modern, with glass windows and cube-ish furniture. In between classes on Tuesday, Claire, Jessica and I walked around Covent Garden, Chinatown and Oxford Street. We looked into many stores that we’d never ever be able to afford (where’s my friend from Tiffany’s when I need her?) We stepped into a vintage magazine store that had endless copies of Vogue from decades past. London has a great balance of independent and chain stores. You can find a Starbucks and KFC on almost every corner, but hidden in the nooks are “mom and pop” (or should I say mum and dad) bookstores, jewelry stores and clothing shops. On Wednesday we went to a pub to watch the Chelsea soccer game, so it’s clear that we’re true Londoners now. It was packed with true football fans that were much more into the game than I. Football is truly England’s sport of choice, even though some might argue that cricket is more fitting. Cricket doesn’t get people excited and slamming their drinks down on the table. Football gets their blood boiling, their voices rising and their fist pumping. The energy is contagious! On Friday we took a boat down the South Bank to Greenwich. Once again, it was “cold enough to freeze the balls off a brass monkey” as they say here in England. 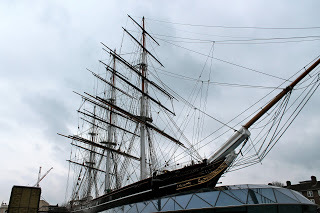 We saw the Cutty Sark, which was one of the fastest British clippers to be built. 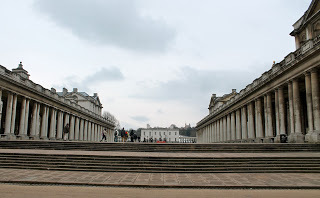 We then power walked to the Old Naval College, which is where scenes from Les Mis, Sherlock Holmes and Harry Potter have been filmed. Many film crews use the location because it’s reminiscent of Victorian England. 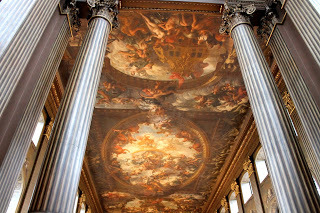 We went into the Painted Hall, which is a room filled with intricate paintings by James Thornhill. The artist actually painted himself into the portrait with his hand out asking for money because he wasn’t paid on time. The staff at the hall put a life-size version on the grounds to ask for donations for their upkeep. Because I’m a college student on a budget, I could only offer him a dance. He wasn’t having it. A dance, sir? No? 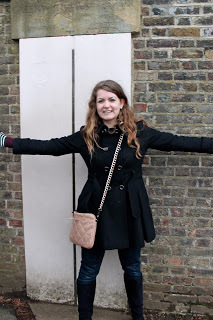 Ok.
We then went up to the Royal Observatory, which is the home of Greenwich Mean Time. I stood in both the Eastern and Western hemispheres at the same time, so I have completely upgraded my abilities as a world traveler. That night we went to Barfly, which is where Coldplay, Adele, Amy Winehouse, The Killers and my girl Florence Welch all played very early into their careers. There was no live music, but I did have a fun time dancing to British Indie rock. For once I can focus on dancing to the music instead of lip-synching the chorus verses to rap songs. On Saturday we went on a walking tour of the South Bank, and it was thankfully above 35 degrees Fahrenheit. I know I’ve been living in London for almost 20 days, but seeing Big Ben, the houses of Parliament, the Tower Bridge and the river Thames up close made for a true “wow” moment. I had a short pause for internal reflection where I thought “wow. I’m actually here. In London. 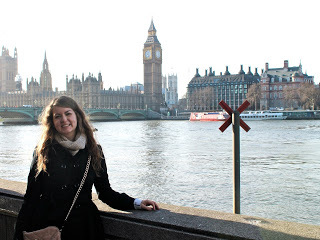 Seeing all of these iconic sites.” It was a beautiful, sunny London day and I couldn’t imagine being anywhere else. We took a lot of pictures, perused a book sale and stopped so Claire could satisfy her craving for chips and guacamole. Mexican food is not as common here. We’re too far from the border for that, I guess. 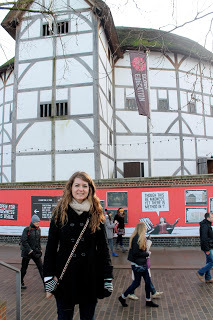 I also got to see the reconstruction of Shakespeare’s Globe. There won’t be any shows until the last week that I’m here, but you can bet I’ll return to watch a show performed live on stage in my last few days in London! We tried to go to a bar in Soho that night, but weren’t on the guest list (I know, I’m not sure why either). On the bright side, we did get to see some of Soho while walking around in the drizzle. Today we went to Portobello Market, which is a two-mile stretch of shops down Portobello Road. It took us almost an hour to get there because our tube station (and the entire line for that matter) is closed for maintenance this weekend. We’ve been condemned to the bus, which stops much more frequently and has to fight London traffic. I’ve never appreciated the tube more. I’ll try to remember this when I’m crammed up against a stranger’s armpit on the tube tomorrow morning. Back to Portobello Market, where we walked almost the entire length and saw a mass amount of antiques, jewelry and crepe stands per square foot. I’m definitely going to have to make a trip back sometime soon. I need more time to look at all of the dresses! I’m not sure what will happen this week besides work and classes, but there is always a lot to do in London. I can’t wait to see what this last week of January brings!